A team of UC Santa Cruz graduate students led by computer science professor Marilyn Walker has been chosen by Amazon to compete for the 2018 Alexa Prize, a $3.5 million university challenge to advance conversational artificial intelligence. The UCSC team, called SlugBots, is one of eight university teams sponsored by Amazon to try to develop a "socialbot" that can converse coherently with humans using Alexa, the voice-controlled digital assistant in Amazon's Echo and other devices. Amazon is giving each of the teams a $250,000 research grant, Alexa-enabled devices, free Amazon Web Services (AWS) to support their development efforts, and access to other tools, data, and Alexa team support. The team with the highest-performing socialbot will win a $500,000 prize. An additional $1 million research grant will be awarded to the winning team's university if their socialbot achieves the grand challenge of conversing coherently and engagingly with humans for 20 minutes. Walker's SlugBot team also competed in last year's inaugural Alexa Prize competition, which was won by a team at the University of Washington. None of the teams were able to achieve the grand challenge. 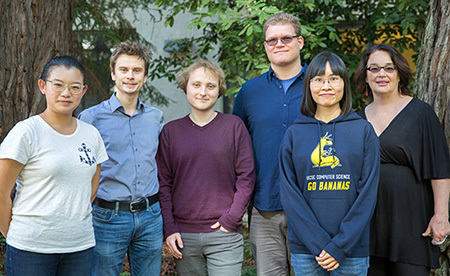 The 2018 SlugBot team includes two students from last year's team, team leader Kevin Bowden and tech leader Jiaqi Wu, and three new members, Jurik Juraska, Vrindavan Harrison, and Wen Cui. Walker heads the Natural Language and Dialogue Systems Lab in the Baskin School of Engineering at UC Santa Cruz. The lab focuses on computational modeling of dialogue and user generated content in social media, such as weblogs and online chat forums, as well as the generation of expressive dialogue for conversational agents for a range of applications, including human-robot dialogue, storytelling agents and tourist information systems. Much of the work in Walker's lab is data driven and involves mining social media to compile a large database of examples of social language and casual dialogue, and then analyzing and annotating them so they can be used to train computer algorithms using machine learning techniques. The SlugBots approach builds on the ongoing work in Walker's lab on various aspects of what is sometimes called "conversational artificial intelligence." Live interactions and feedback from Alexa's large user base will help the team test ideas and develop their algorithms. A primary goal of the Alexa Prize is to advance the science of conversational AI. To this end, the Alexa Prize Proceedings publishes each team's research resulting from their pursuit of the challenge. Papers from 2017 participants are available here.